I recently spent a couple days at dCS headquarters in Cambridge, England to get all the details about the new Bartok DAC / Headphone Amp and more importantly to listen to the Bartok on the dCS reference system. The Bartok is quite a component, to say the least! Upon my arrival at dCS on Monday morning I walked past an interesting contraption with clothes hanging inside. John Quick, General Manager of dCS Americas, told me it was a drying rack for the clothes of the guys who bike into work. Several guys at dCS are very serious bikers. The kind of biking that requires endurance, not the kind that requires a leather jacket and loud pipes. I only relay that story because I know a large contingent of CA readers also enjoy biking. I spent the first hour of my time at dCS sitting down with Director of Product Development Chris hales and Technical Directory Andy McHarg. My first question to them was, why replace the Debussy? Little did I know this was a loaded question, but very fruitful question. The Bartok may replace the Debussy in the dCS lineup with respect to its least expensive full featured product, but that's where this replacement talk ends. The Bartok is not billed a replacement for the Debussy. Bartok is much more a Rossini Jr. to me than a dCS replacement, but those are my words, not the words of Chris or Andy. The Debussy's best days are behind it because its control board is comprised of a few out of production parts, the analog board is a much older generation, and as Chris puts it, Andy filled up the FPGA. The Debussy FPGA has reached its max through continual software upgrades since the product's initial release in 2010. Work on the Bartok started in earnest over a year ago even though dCS had experimented with headphone output stages for much longer. The dCS team is full of engineers. Of course they've built headphones amp before the Bartok was even a twinkle in their eyes. According to Chris Hales, he tool the essence of the current dCS balanced output stage and adapted it to what he wanted to use for driving headphones. I know people prefer to read about "ground up" designs and engineers who "start over" but it just doesn't make sense when you've already done the work at this level. When Rolls Royce released the Dawn convertible, it didn't "start over" as Apple's Jony Ive is so fond of saying (link). Rolls Royce started with the Wraith and made the appropriate changes to it (despite what the company says). As headphone listeners know, the range of impedances in high end headphones is enormous and can require a lot of current or large voltage swings. The team at dCS understands this and designed the headphone amp accordingly. According to Chris Hales, "I decided the headphone amp must be the same as the balanced output stage in that both have to run in Class A." "It's Class A for all practical purposes" said Hales in a quick follow up as engineers often do. Hales said it's possible to pull it out of Class A by doing something impractical like connecting loudspeakers or something one would never do. The bottom line with the headphone output is that it contains the refinements needed to drive headphones. That's what separates it from the already stellar dCS analog output stage. The Bartok headphone amp board provides roughly 20 dB of attenuation with the analog board providing the 2v / 6v high / low switching capability. Across from Hales sat Andy McHarg, who is the genius behind much of the dCS software. Andy said, "The software in the Bartok isn't enormously different from al the other dCS DACs." There are two volume controls in the Bartok which is a major difference programmed into the unit. The Bartok has plenty of processing power for future upgrades. I know that sounds like Bill Gates and an infamous cute about nobody needing more than 640k of RAM, but given the dCS track record of upgrading its products for many years, I tend to believe Andy. The current Debussy is going on eight years as a "current" model in the dCS lineup. I see no reason why the Bartok won't remain current for at least that long. Andy also mentioned that the Bartok is a full featured dCS network capable DAC with headphone amp. This isn't some half-hearted dCS attempt at making an inexpensive product. Sure the Bartok is $15,000 in the US, but if bypassing a preamp because of its built-in volume control or using it as a complete system with headphones, the price is much more friendly. To Hales, McHarg, Quick and the rest of the dCS team the headphone space is really exciting. The company is approaching it cautiously by doing things at the highest level, the only way it has ever done things. Like Rolls Royce and cars, dCS doesn't release half-baked DACs. I asked McHarg and Hales about the difference between Bartok and Rossini, other than price. The response required a pause by both parties. Not because the products are so different, but because they are so similar. The Bartok has one fewer transformer, if you exclude the headphone amp, than the Rossini because a single transformer powers the entire thing (save the headphone amp that has its own transformer). Major differences in the mechanicals / chassis account for much of the price difference. The electronics aren't compromised just to hit a lower price. When I asked about other differences that dCS could purposely implement McHarg said, "We don't impede performance just to differentiate models ." After the interview I headed down to the Audio Element designed dCS listening room. We had to round up a Bartok that wasn't in some form of disassembly as the engineers were running tests on the available units at the factory. The Bartok was connected directly to a pair of D'Agostino monoblocks and Wilson Audio Alexx loudspeakers with all Transparent Audio cabling. Andy McHarg haded me an iPad and I was off and running with full control of the system and the ability to play whatever music I wish. That may sound like I'm mastering the obvious, but several manufacturers won't let anyone play music other than a set manufacturer selected playlist when visiting the factory. Anyway, I started with a little Tracy Chapman. Talkin' 'Bout a Revolution and Fast Car are two amazing tracks that have held up over time. Both sounded effortless and had a bass groove that gave me the fuzzies. The sound was classic dCS for a fraction of the price. I was very happy with this as a start fo my experience with the Bartok. As I always do, I put on a little Eddie Vedder. Playing Society from the Into the Wild Soundtrack, the system reproduced such a transparent presentation. Vedder's voice just hung there in the air. On the flight over to the UK I really got back into Portishead's album Dummy. It only made sense for me to play the track It Could Be Sweet through this Bartok based system once I landed. Not an audiophile recording by any means, but one that I listen to for enjoyment. It had fantastic punch in the bottom end and a wonderful delicacy in Beth Gibbon's vocal range. Yes, it was just a bit better than listening through my headphones in seat 27F on my way to dCS. I finished up my listening session with Pearl Jam. Breathe off the album Backspacer features an acoustic guitar that sounded incredibly authentic and organic for a rock and roll recording. Perhaps I was already sucked in after the first few notes, but that's why this equipment exists anyway. In Yellow Ledbetter I head Mike McCready's fantastic guitar and a kick drum with real presence. I hadn't heard that track sound so good in recent or distant memory. I closed out listening to Elderly Woman Behind the Counter in a Small Town. Pearl Jam's attempt to counter short track names on its sophomore album. Jeff Ament's bass kicks in early on in the track and it provides such a foundation for the mid and high frequencies. All of this is very delineated through the Bartok as each instrument is simple to pick out in space with air around each note. My trip to the UK was short but very sweet. I wanted to get my ears on the Bartok in the best listening room possible, rather than at an audio show with an ambient noise level louder than the airport. I also wanted to hear about the Bartok straight from the designers' mouths. The best way to accomplish this was to get on an airplane. I'm very pleased I was able to spend time listening as long as I wanted and to whatever music I wished. The only thing better than listening to one's own selection of music is listening to the same items in one's own listening room. For that experience, I look forward to receiving the Bartok as soon as production units are shipping. Time to go back for a video factory tour! Very cool can't wait to hear more details Saturday night. You had me at Class A headphone amp! This is an intriguing product. Would, of course, be interested to compare to the Rossini+Network Player and see what the difference in SQ for the big difference in price. I'd bet not much. I suppose the dCS Network Bridge plus Bartok will outperform the Rossini for less money. Nice! Thx Chris. dCS truly cares about the quality of their product AND continued support and evolution. I am very happy to be their customer. Does it need a bridge? 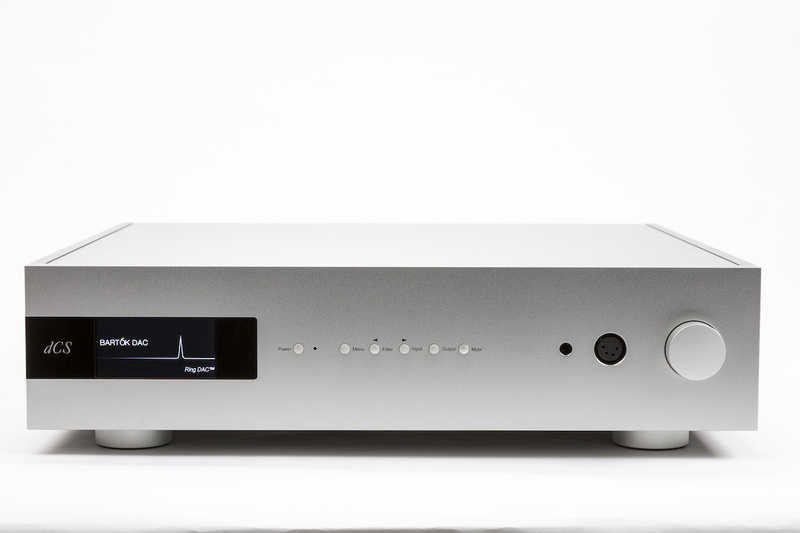 "the Bartok is a full featured dCS network capable DAC with headphone amp." It seems there are more and more hi end "Network Capable DACs". Hopefully some comparisons will follow. This category is of great interest. There is absolutely no reason to use a Bridge with a Rossini or Bartok. There will be no performance gains and some control functionality will be lost. With the additional Bridge you have a complete separate PS and a higher performing processor with wifi. Why would a separate power supply, faster processor that's unneeded in the DACs, WiFi, and a conversion to AES or SPDIF before hitting the DAC be beneficial? Okay, I'll rephrase. It would be interesting to hear someone who auditions the Bartok and Rossini and comments on the SQ difference, and how much. Makes no difference. The CPU on the bridge has the ability to operate at a slightly higher clock frequency, but idle CPU cycles are idle CPU cycles. No impact on sound quality. The separate power supply has negligible impact in this particular application. The power supply in the Bartok is considerably more robust than what's in the bridge. Wi-Fi isn't enabled in the bridge and likely won't be. It's not. It's adding complexity for the sake of adding complexity. No real gains, some losses, and considerably more money. We'd love to sell more Bridges, but we aren't going to lie to prospective customers and endorse this type of configuration. It's silly. It's not an especially valid comparison right now as Rossini is due for an update which will have a significant impact on its sonic performance. Thanks. Appreciate your participation here. If I'm not mistaken, this update is software only. Rossini owners needn't worry about out of date hardware. What exactly are the hardware differences between Bartok and Rossini? Chris covered it in his write-up. In terms of hardware Bartok has a less complex power supply and a less complex chassis. The real difference will be in the software. As our DAC architecture is software-defined we can realize performance gains through a simple firmware update. In the case of Bartok the software is very similar to Rossini as it stands today. Rossini will get an update to apply some of the algorithms from Vivaldi. IIUC, if Bartok receives the same software update as Rossini the performance differences would be negligible. We have the Bridge with AES out to a pair of Devialet monoblocks, sourced from a ROON Nucleus, and is it so easy to hear how much better it is compared to a direct ethernet out from the same ROON endpoint. In this case, it is in the addition of a second stage between source and playback that improves the signal. I can only imagine how good the Bartok can be but suspect it will be brilliant. I want to know how headphones sound out of this. yeah ; and I could be as enthusiast about my cheap TEAC, albeit HQP fed, and even add a note stressing soundstage effect and instrumentation being a jewel case to Beth Gibbons' vocals. The 15K headphone Amp space is getting crowded, this one includes an absolute SOTA DAC as well... That and a pair of HiFiMan HE-1000v2 headphones next to an iMac might be a good sounding system.